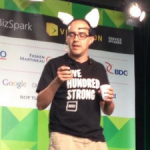 Dave McClure has centered his talk at the Montreal Startup Festival on Marketing and Growth, which is a theme I’ve been echoing for a while now. But he has focused too much on the Demand Gen side of Marketing and didn’t mention the importance of branding and communications, which are necessary to develop a long lasting relationship with your customers. Dave has equated Growth Hacking to your Marketing Strategy, and I have previously depicted Growth Hacking as a bridge to Marketing, because it paves the way to letting you pull the many levers that marketing offers when your growth is on a consistent trajectory. So, we violently agree here. Marketing is the third leg that will be responsible for any startup’s success, assuming you can build a great product, and achieve product/market fit. Marketing doesn’t really matter that much until you need to grow as soon as you achieve product/market fit. What comes next will depend on your GO-to-market and positioning approaches. Product/fit gives you the ammunition and credibility to solidify this position. But don’t confuse Product position with company positioning and messaging. They are not the same. Positioning is not what you do to the product. Positioning is what you do to the mind of your prospects. You’ll need to read this, Positioning: The Battle for your Startup where I elaborate on Positioning in the context of startups. 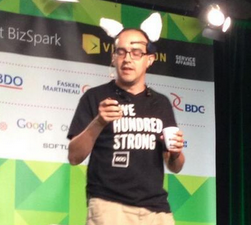 Here is Dave McClure’s Slideshare from his Montreal Startup Festival Talk. And Fred Destin wrote a post summarizing Dave McClure’s points: Dave McClure on Growth Hacking you way through the Series A Crunch. Dave, if you are reading this,- Yes, marketing is changing with digital and online [<– link to my post], but branding will remain branding. The bigger a startup becomes, the more branding becomes an even more important factor for creating further demand, loyalty and referrals. Ask Zynga [<– Divide and Conquer] who is working now on increasing their brand loyalty. And ask DropBox who understood the importance of brand, positioning, messaging and marketing mojo early on. So, as a startup, you’ll also need to focus on branding your company, whether you call that traditional marketing or not doesn’t matter. The channels have shifted with online, but branding will remain branding (I know I said that already). What is even more important than Marketing? It’s the Realization of your Business Model. It’s even more important than Product, Engineering, or Marketing. After all, it’s the customer that determines what your business is.